James Bond’s presence on the silver screen for the past 50+ years has established a formula that has perhaps superseded that of Ian Fleming’s original novels. It’s hard for me to say, not having read any of them, but certainly on film, there is an opening sequence of action and stunt work that sets the tone for the rest of the narrative. 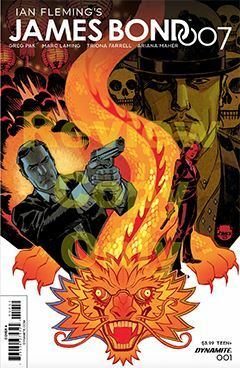 And this first issue of Dynamite’s new James Bond, 007 series reads like the opening sequence. It begins with a deal in a crowded Singapore nightclub. Lots of noise and chaos as a Russian delivers a case to a group of Asians. But the deal goes south when a new player – later identified as Mr. Lee – gets involved. What his motivations are is not clear, though he clearly is after the Russian. But so is Bond. Allies? Rivals? Time will tell. As foot chases and fist-fights ensue, the action comes fast and furious. And I fear this is where writer Greg Pak missteps. If comics are a blend of words and pictures, one should enhance the other. Perhaps not always equally, but generally it’s a50/50 arrangement. In the course of the fight between Bond and Lee, Pak inserts every grunt, groan, and intake of breath, which I found distracting from the action. He also uses a great deal of foreign dialogue (Russian, Filipino and French) without any benefit of subtitle or translation. I’ll grant that this is perhaps more true to life, but it otherwise became meaningless characters within word balloons. I appreciate Marc Laming’s artwork. It almost has an old-school 1960s style, which works well for Bond, even though the story is clearly set in contemporary times. I am uncertain how long this particular story will run, but I hope he is in for the long haul. I’m looking forward to the ride.